To open: Push the switch down firmly. To close: Pull the switch up firmly. To open: Push the switch down lightly, and hold it until the desired position is reached. To close: Pull the switch up lightly, and hold it until the desired position is reached. Closing a power window on someone's hands or fingers can cause serious injury. 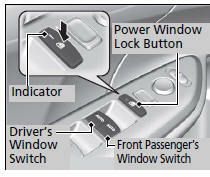 If a power window senses resistance when closing automatically, it will stops closing and reverse direction.